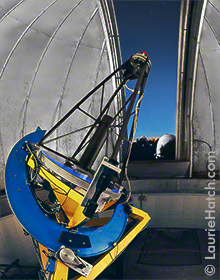 The Katzman Automatic Imaging Telescope (KAIT), a 30-inch robotic telescope, is operated by computer. Astronomers and telecsope technicians have programmed KAIT to look for supernovae every night of the year without need for human operators. 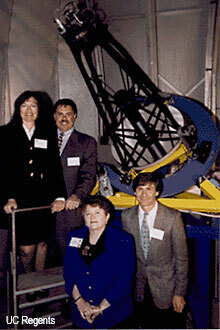 PI Alex Filippenko conceived and designed this telescope to maximize efficiency in finding supernovae and to faciliate early discovery, so that supernova life cycles could be observed long before reaching maximum brightness. KAIT is named for the Sylvia and Jim Katzman Foundation, which donated $50,000 at a critical time in the telescope's development. Much of the rest of the funding for KAIT, which totaled about $500,000, came from the National Science Foundation. After checking the weather and finding it satisfactory, KAIT opens its own dome and begins observation of a preprogrammed list of galaxies, searching for new supernovae. KAIT records the data and compares it with previous data from the area surveyed. If changes are noted, indicating possible new supernovae, KAIT automatically emails UC Berkeley astronomers, who then follow up by making observations of their own to prove or disprove the supernova event. When morning comes, KAIT closes its dome and shuts down operations until the following evening. Prior to the completion of the KAIT, about two supernovae were found per month in the entire world. KAIT alone now finds about two supernovae per week. Because KAIT discovers these supernovae long before maximum brightness, they can be measured with great precision. KAIT is also potentially useful for other projects which require nightly observations of changing objects. Examples include monitoring known variable stars, looking at quasars and active galaxies, and observing positions of asteroids and moons. KAIT's tracking system is much superior to that of earlier robotic telescopes. KAIT has a separate CCD imaging system for a guide star, keeping the telescope precisely fixed on a given area of sky as the earth rotates. Earlier robotic telescopes with simpler tracking systems allow significant drift within a couple of minutes. Another improvement is software that makes it easy to orchestrate a night's observing. Targets are entered with a priority number and the computer determines when and how long to look at each one. The computer can automatically change the effective priority of a given target, depending on whether observations were successful in preceding nights. For more information about KAIT, visit the KAIT website hosted by UC Berkeley. The photo on the right was taken at the KAIT Dedication. Pictured are donors Sylvia and Jim Katzman (back row), former UCSC Chancellor MRC Greenwood, and UCB professor/KAIT PI Alex Filippenko.